Founded over 20 years ago, Hardman & Co is an FCA registered capital markets research and consultancy business serving the UK corporate sector Recognised for research and advice of the highest quality. The demand for tax enhanced products is growing. Hardman & Co enable wealth advisory and financial planning firms to sell these products with confidence. Hardman & Co have an enviable track record of delivering high quality research on quoted companies for more than twenty years. Their reviews are thorough and practical. Confidence grows with knowledge. The training that Hardman & Co offer is not just about the products, but also how they can be used in practical ways for the benefit of your clients. 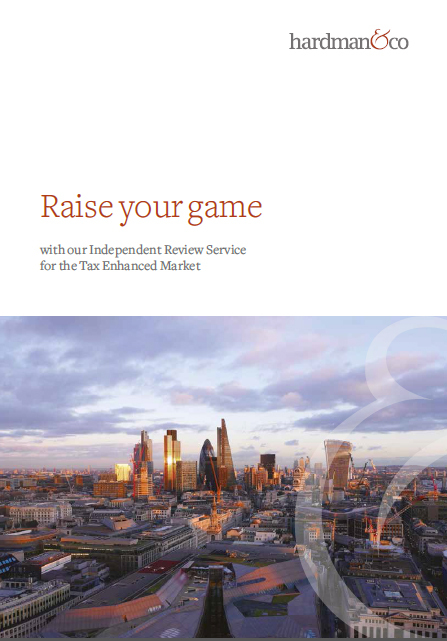 Hardman & Co have the breadth of market knowledge to create bespoke panels of providers of tax enhanced products. Panels that are tailored to each advisory firm, that are right for your culture and client profiles. Importantly they also keep you updated with changes and new developments in this market place. Hardman Research Ltd, trading as Hardman & Co, is an appointed representative of Capital Markets Strategy Ltd which is authorised and regulated by the Financial Conduct Authority.